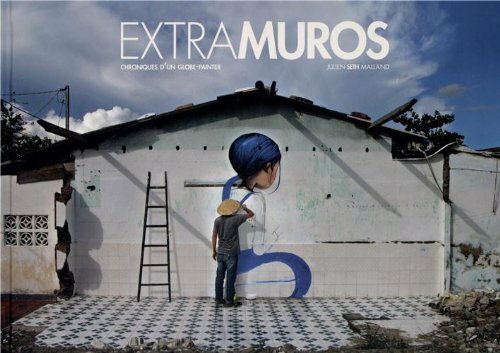 Extramuros (Outside of the Walls) is the new and wonderful book by Seth the Global Painter – who I recently featured in Varoom Magazine. I wanted to give the book a plug not least because I wrote the introduction to it! Welcome to the world as seen through the well-travelled paintbrushes and sketchbooks of Parisian artist Seth – the Globe-Painter. From Mumbai to Dakar, Oaxaca to Yojakarta, Seth has made a modern day pilgrimage to explore the world through paint, colour and cultural exchanges with artists he has met along the way. Driven not only by a natural wanderlust but also a curiosity to discover more about the lives of people in different places through the art they produce. His approach has been to create an artistic dialogue, whether it’s by painting with local street artists or learning from traditional craftsmen, his aim is to create a mutually inspiring two–way exchange. As we see in this book’s exquisite photography, what captures the artist’s eye are the differences between places; the pigmentation of a wall, the local vegetation or a particular kind of typographic stencilling used in a specific city. These details and flavours are then absorbed and infused into his work and investigations. Rather than view this visual information as something ‘other’ or exotic, his response is to learn through conversations with local people about the traditions that make each place aesthetically unique. Often this means discovering the secrets of fabrication, be it studying batik processes in Indonesia or lending a hand to bus painters (is there a word for them?) in Dakar. Learning by doing is his method and in the same way his collaborators often learn something from the artist. 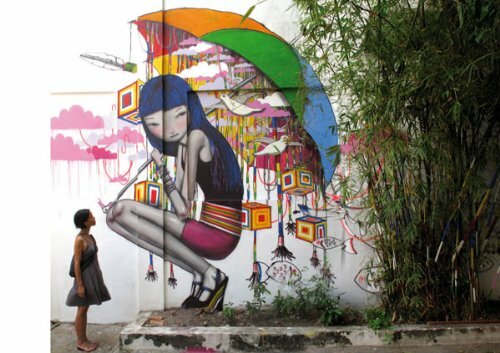 For instance, the batik artists of Indonesia (name the place) who subsequently became inspired to paint their own murals, or the professional painters in Dakar who were equally keen to study Seth’s spray-can techniques. Despite the beautiful diversity witnessed in the following pages, it has become ever more clear to the artist that globalisation is a powerful force that is having a homogenising effect on countries around the world. Wherever you travel in urban areas you will find the same familiar tower blocks, multi-national brands, hip bars and hipsters. Even in the most remote places it’s hard to find somewhere completely untouched by this influence. Through his own experiences the artist has come to realise the importance of specificity and that local artistic traditions and skills need to be kept alive. While it maybe impossible to stem the effects of globalisation and keep local traditions in a state of historic purity, the answer may lie in a form of cultural hybridity. Seth’s own work promotes this idea through a modern cultural mix, which celebrates artisanal traditions by bringing this kind of art back to the masses on the street. As a fellow traveller and documenter I hold a particular admiration for Seth’s dedication, enthusiasm and conscious approach to travel and making art. 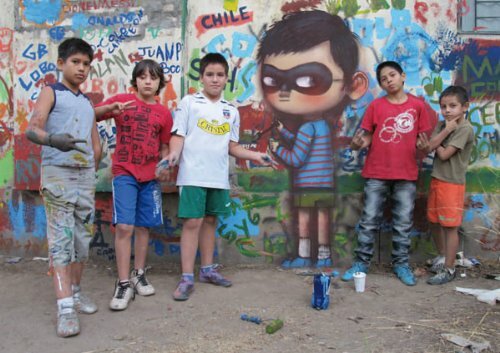 Rather than impose a street piece on a neighbourhood that is unwanted or misunderstood he takes time to get to know the local community and its particular stories. 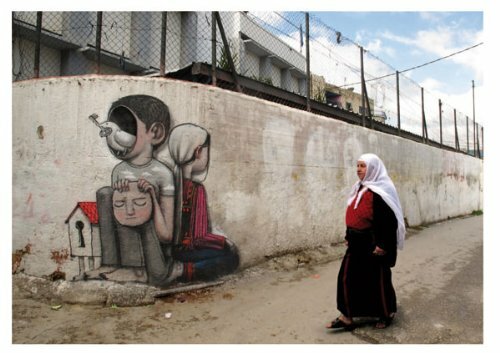 In this way his work is more of a public art than street art, since the process of consultation is integral to it. 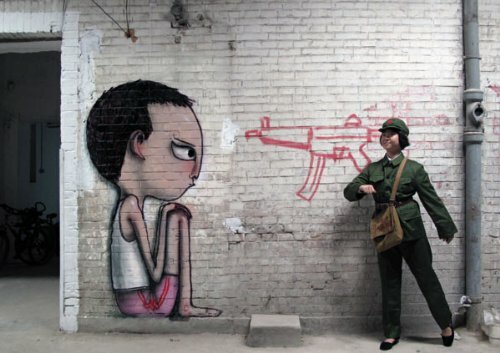 He uses simple characters that are somehow connected to their environment that he hopes will speak to ordinary people. In the artist’s opinion the placement of a piece is fifty percent of the work, since it can draw attention to a particular environment or place. For instance his paintings of figures in Indonesia (name place) a village destroyed by a volcano bring about a symbolic attention to a community in need of help. 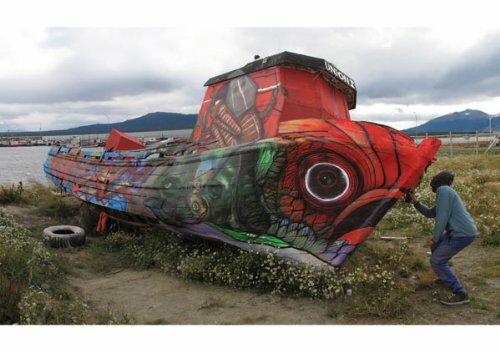 In a similar fashion his collaborations with other artists such as Saner and Neuzz in Mexico are less about the ego of an individual artist and more about creating harmony in jointly painted work so that it looks like one person created it. Many of the adventures and collaborations documented in this book have come about in spontaneous and fortuitous ways. Armed only with a camera and sketchbook our wandering artist relies on the generosity of the people he meets to share their skills and view of the world, which in turn he creatively distils into wonderfully engaging images. His global painting mantra can be summed up in a few words – tread lightly, learn something and leave something beautiful.